In the world of design, talk is cheap. 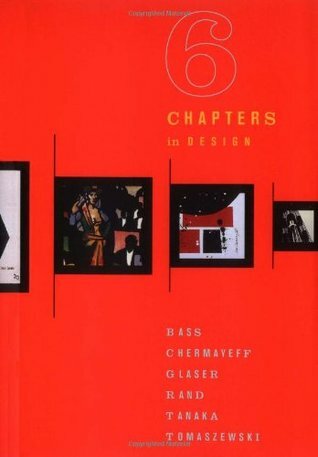 In this book, that theory is practiced and proven multiple times through the showing of work from six design gods of our time: Bass, Chermayeff, Glaser, Rand, Tanaka and Tomaszewski. Rather than bore you with a lot of details, I'll just say this: it's a fat little book in full color that shows an example of the designer's work on every page, from beginning to end. It is printed on thick, luxurious slick semi-gloss paper. It is a designer's dream!The book was out of print for a little while, but now it appears to be back. A first edition will cost $200, but I've seen later editions on Amazon for as little as $16. Well worth it. There are over 300 different designs in the book and it is a mind bending experience to see them all. If you're a designer, or if you are the type who appreciates design concepts, this is the book for you. Great eye candy, you'll love it.Note: all of the designs were created before the days of CGI graphics, so it's definitely an "old school" book, but the designs hold up over time and are still delightful to view. This was really interesting and I enjoyed looking at all of the cool art!!! However I wish the designers weren't all men :( where my ladies at also I wish there were more info included on the individual works, especially the more famous ones. The most interesting chapter, to me, was Milton Glaser's as he showed a sketch next to the finished piece. It was fun to see the final design compared to the original idea.